CE TEST To take the CE test for credit, click here. Stephanie received her associate of applied science degree in veterinary technology from Jefferson College in Hillsboro, Missouri, in 2005. She began working at the University of Missouri Veterinary Health Center as the neurology/neurosurgery technician in 2007 and received her certification in canine rehabilitation from the University of Tennessee in 2008. She received her bachelor’s degree in veterinary technology from St. Petersburg College in 2011 and her Veterinary Technician Specialist credential in neurology in June 2013. Stephanie is a deputy member with the proposed Academy of Physical Rehabilitation Veterinary Technicians as well as an adjunct clinical instructor with the Biomedical Sciences Online Program at the University of Missouri. She is pursuing her master’s degree in biomedical sciences with an emphasis in veterinary sciences. Intervertebral disc herniation (IVDH) is the most common spinal disease in dogs. This painful and debilitating disease occurs in about 2% of canine patients seen at teaching hospitals but is rarely seen in cats, horses, and food animals.1 Hansen first classified intervertebral disc (IVD) disease as type I and type II in 1951. Type I IVDH is an extrusion of the nucleus pulposus, and type II IVDH is a protrusion of the annulus fibrosis. Management of IVDH by a combination of medical and surgical methods is now well established, with high success rates reported (up to 95%).2 Veterinary technicians can play an important role in management of these cases. FIGURE 1. Position of the intervertebral disc. Intervertebral discs separate the vertebral bodies along the entire length of the spinal column, with the exception of the atlanto-axial joint, and between the bones of the sacrum.3 These discs permit motion of the spine while providing support under movement. The annulus fibrosis is the ligament that makes up the periphery of the disc and attaches to the vertebral end plates. The nucleus pulposus is the highly hydrated central portion of the disc (FIGURE 1). A common aging process known as fibroid metaplasia can result in degenerative changes in the disc. In this process, a decrease in proteoglycans, due to pathologic or age-related changes, results in decreased water content within the nucleus and annulus. These degenerative changes are accelerated in chondrodystrophic dogs, which predisposes them to early IVD degeneration. As noted above, 2 types of disc degeneration have been described. Hansen type I IVD degeneration occurs commonly in chondrodystrophic breeds, such as the dachshund and beagle. However, it may also be seen in large breeds. This type of degeneration leads to an extrusion of the nucleus pulposus into the vertebral canal. Type I IVD degeneration affects young animals, with clinical signs developing between ages 3 and 6 years. Calcification of the degenerative disc is radiographically apparent in dachshunds by 6 to 18 months of age.1 The degenerative process leads to a weakened annulus that cannot confine the calcified nucleus pulposus. Normal movements of the spinal column are enough to cause an acute disc herniation. This extrusion of nucleus pulposus leads to an acute onset of clinical signs. Hansen type II IVD degeneration is most common in large nonchondrodystrophic breeds, such as the German shepherd and Labrador retriever. Fibroid metaplasia leads to a slow protrusion of the disc into the spinal canal. Both the annulus and the nucleus can protrude, but the annulus remains intact. Hansen type II degeneration develops more slowly than type I, and clinical signs become apparent between 5 and 12 years of age. Spinal cord compression from Hansen type II IVDH results in a slowly progressive myelopathy. German shepherds and Labrador retrievers may present with Hansen type I or type II IVD degeneration. Clinical signs of IVDH can range from spinal hyperesthesia (back pain) only to paraplegia without pain sensation. Spinal hyperesthesia is caused by compression of the nerve roots and meninges. Animals may have a hunchback appearance (kyphosis) and tense abdominal muscles if they are in pain. Paresis (weakness) or plegia (paralysis) may affect any limb depending on where the disc herniation is along the spine. When describing the extent of clinical signs, mono refers to one limb; hemi, to limbs on one side (eg, right thoracic and pelvic); para, to pelvic limbs; and tetra, to all 4 limbs. 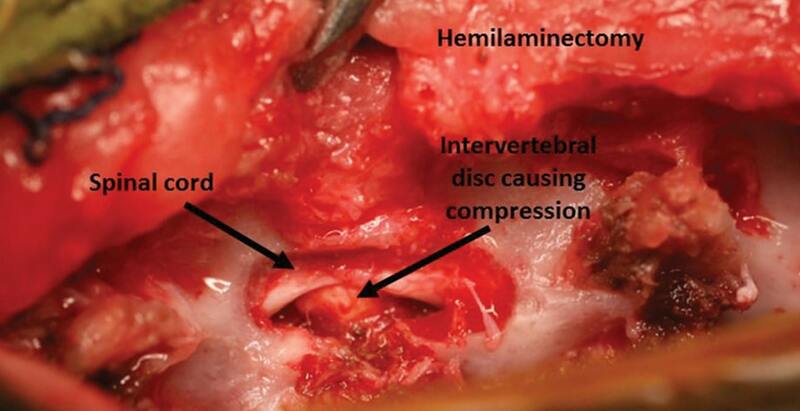 For example, if the disc herniation is in the cervical spine, the animal may be tetraparetic (weak in all 4 limbs). However, if the disc herniation is in the caudal thoracic spine, the animal may be paraparetic (weak in the pelvic limbs). If the animal has lost all movement to the affected limbs, the correct term is plegia. If an animal is paraplegic, it is important to check the affected limbs for nociception (the ability to feel pain) because lack of nociception does affect prognosis. The disc herniation may be lateralized and compress one side of the spinal cord more than the other, which may produce asymmetric clinical signs. A presumptive diagnosis may be made on the basis of signalment, history, clinical signs, and neurologic examination findings. However, a definitive diagnosis can be based only on further diagnostic testing, such as myelography, computed tomography (CT), or MRI. FIGURE 2. Radiograph showing mineralized intervertebral discs. FIGURE 3. Myelogram with arrowheads showing attenuation of contrast column at site of compression. FIGURE 4. CT scan with arrow pointing to herniated disc within the spinal canal causing compression of the spinal cord. Cross-sectional imaging, such as CT or MRI, is required to determine the active region of spinal cord compression, and is now considered the standard modality for evaluation of IVDH. CT may be used in conjunction with myelography to better delineate lateralization of the IVDH but may also be used as the sole diagnostic modality. It is noninvasive and fast, with images acquired in minutes. Diagnosis of spinal cord compression by using CT is similar to diagnosis via radiography in that it is based on identifying the anatomic landmarks where attenuation of the spinal cord is visible, but compared with radiography, it offers enhanced soft tissue contrast and visualization (FIGURE 4). CT does have some advantages over MRI in the evaluation of bony lesions. In cases such as vertebral fractures or luxations, CT may provide more useful information than does MRI. FIGURE 5. 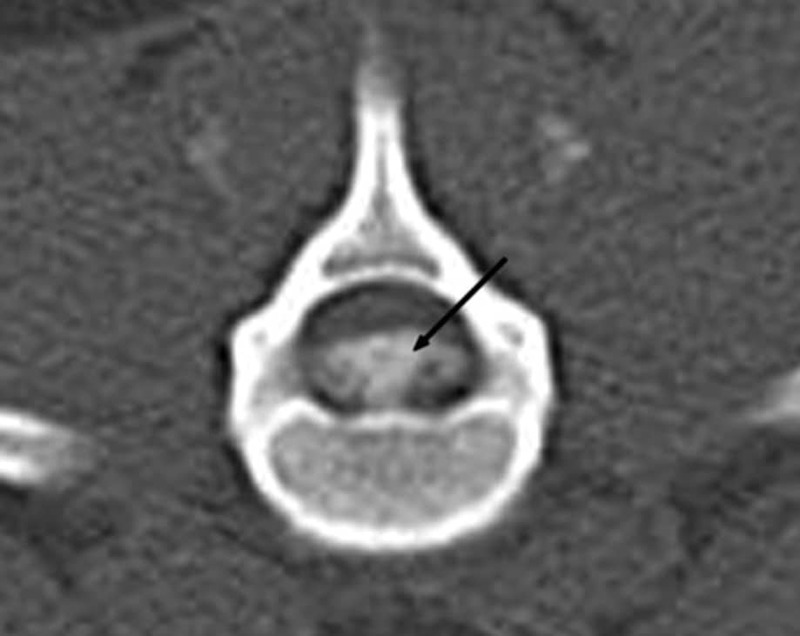 Sagittal MRI image with arrow pointing to herniated disc material within the spinal canal causing compression of the spinal cord. MRI is the gold standard imaging modality for almost all neurologic disease processes. It provides superior soft tissue contrast, which allows further differentiation of anatomic structures. Like CT, images may be viewed in many different planes (sagittal, transverse, dorsal), which allows close scrutiny of anatomic regions (FIGURE 5). In patients with multiple affected sites, MRI is best for differentiating the inciting cause of the current clinical signs. MRI is based on the properties of hydrogen atoms, which are numerous in tissues with a high water content. When placed in a magnetic field, the hydrogen atoms line up. A radiofrequency pulse knocks the atoms out of alignment. When that pulse is removed, the atoms bounce back to their previous orientation and release energy in the form of another radiofrequency pulse. This second radiofrequency pulse is captured to form the resultant image. The typical MRI finding with disc protrusion or extrusion is focal extradural spinal cord compression centered over a disc space.3 MRI has few contraindications other than anesthetic risks (the patient requires general anesthesia to undergo MRI). 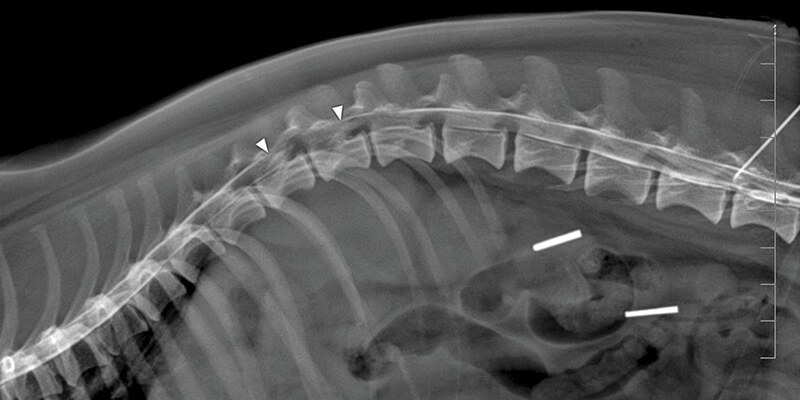 Metallic implants or foreign bodies, such as gunshot, can cause artifacts in the images or can move during the procedure and harm the patient. Treatment recommendations for IVDH vary from case to case. There are no straightforward guidelines on which treatment option is best; rather, guidelines are based on whether surgery should be included as part of the treatment. There are pros and cons to surgery for IVDH. Clients should be informed of the benefits and risks of each treatment option before they make a decision. 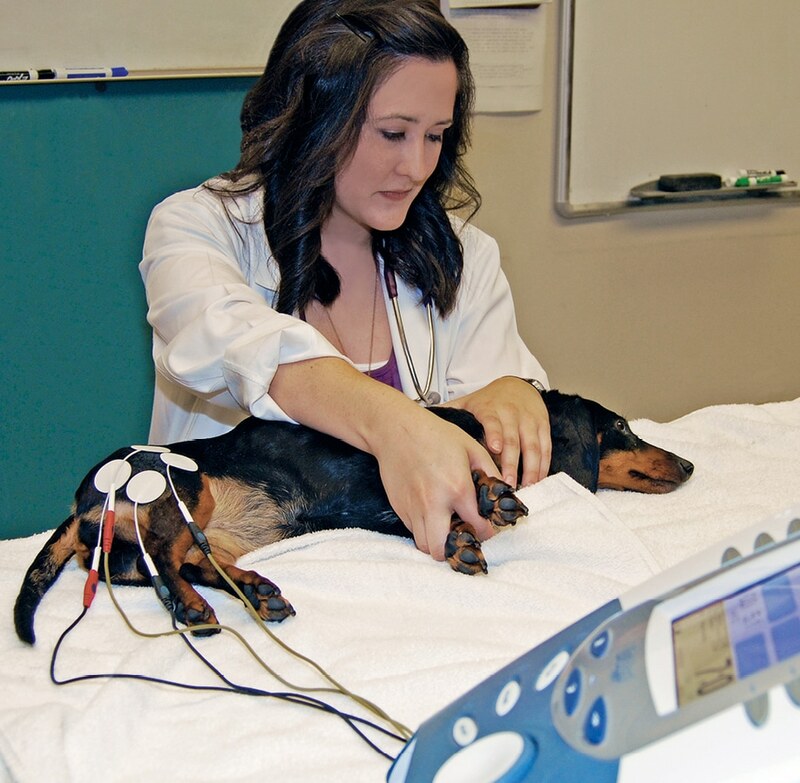 Conservative therapy is indicated for animals that have one episode with mild clinical signs, those whose owners have financial constraints, or those with other medical problems that preclude anesthesia and surgery. Hansen type II IVDH is more commonly treated with conservative therapy. These patients may be treated successfully for long periods with conservative management consisting of pain control and cage confinement; the more important of these is confinement. Strict cage rest is recommended for 4 to 6 weeks. The kennel should be big enough for patients to stand up and turn around in but not big enough for them to walk around in. The patient is let out of the kennel only to go on short-leash walks to urinate and defecate. If improvement is seen, exercise is restricted to a leash for another 3 weeks. Hansen type I cervical or thoracolumbar IVDH that is associated with minimal neurologic deficits but is refractory to conservative therapy. Hansen type I cervical IVDH with moderate to severe neurologic deficits (nonambulatory tetraparesis or tetraplegia). An acute onset of tetraplegia is a surgical emergency. Hansen type I thoracolumbar IVDH resulting in nonambulatory paraparesis to paraplegia. Dogs presenting with lack of nociception (or deep pain perception) should ideally have immediate decompressive surgery within 24 hours of onset of clinical signs. Prolonged loss of pain perception carries a poor prognosis. Many dogs treated conservatively demonstrate initial improvement. Approximately 50% to 100% of patients recover with medical management, with a 30% to 50% relapse rate.3 The recovery rate in nonambulatory patients treated conservatively is lower; deep pain–negative dogs treated conservatively have a recovery rate of 5% to 10%.3 Among patients with Hansen type I IVDH that have intact pain perception, functional recovery is expected in 80% to 95%. In patients with Hansen type I IVDH, the average time to ambulation is about 2 weeks. In nonambulatory tetraparetic or tetraplegic dogs with Hansen type I IVDH, it is reportedly about 1 week. A condition known as myelomalacia is a concern for dogs without deep pain perception. Myelomalacia is liquefaction of the spinal cord parenchyma. It may be focal or diffuse. Myelomalacia affects 10% of dogs lacking deep pain perception.3 Therefore, if a dog does not have deep pain perception, the surgeon may elect to perform a durotomy during surgery to visualize the spinal cord. Diffuse myelomalacia carries a grave prognosis. Recovery in dogs with focal myelomalacia is rare. Supportive care of nonambulatory animals should include prevention of decubital ulcers, urinary tract infections, and muscle atrophy. To prevent decubital ulcers, the animal should be kept on a well-padded bed and rotated from side to side every 4 to 6 hours (FIGURE 7). The skin over bony prominences should be checked daily for reddening. The patient should be kept clean and dry at all times. 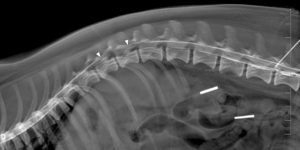 Nonambulatory dogs with thoracolumbar IVDH are often unable to voluntarily urinate. If this is the case, the bladder will need to be manually expressed by applying gentle pressure to the caudal abdomen, or the patient will need intermittent or indwelling urinary catheter placement. Animals that cannot voluntarily empty their bladder completely are at risk for urinary tract infections. The urine should be monitored for foul odor and change in color so that treatment may be instituted if a urinary tract infection does develop. Physical rehabilitation can help to shorten the recovery time for return to ambulation.1 Before a physical rehabilitation plan is developed for any patient with IVDH, it is important to consider the various stages of healing so that treatments may be better customized. Postoperative patients will need to be kept strictly rested for 6 to 8 weeks. 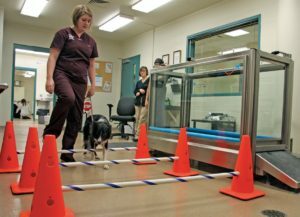 These patients are allowed out of the kennel for only a few minutes 3 times daily to urinate and defecate and to perform controlled physical rehabilitation exercises. When out of the kennel, they should be kept controlled while on a short leash. Postoperative pain from inflammation may be relieved by cryotherapy. A cold pack should be applied to the incision for 10 to 15 minutes every 4 hours for the first 48 hours after surgery.4 After the acute inflammatory period of healing is over, heat therapy may be instituted. This can be accomplished by using a commercially available gel pack. The heat pack can be applied to the incision for 10 to 15 minutes every 4 to 6 hours before other exercises are begun. The patient should be closely monitored during these treatments. Passive range of motion (PROM) is intentional movement of a joint that is performed without muscle contraction. It is used when a patient is unable to move joints on its own or when active movement may be deleterious to the patient. PROM can be performed immediately after surgery and before active weight-bearing and is used to help prevent joint contracture, maintain mobility of soft tissue, reduce pain, enhance blood and lymphatic flow, and improve synovial fluid production. PROM will help maintain joint health; however, it will not improve strength or prevent muscle atrophy. Proper technique for PROM is important. The patient should be relaxed in lateral recumbency and the limb should be supported. The upper limbs are put through a comfortable flexion and extension for 15 to 20 cycles. The limb is then moved through a “bicycle” pattern another 15 to 20 times. This is repeated on each limb and is performed 3 to 4 times a day until the patient is ambulatory. Ambulation is allowed at slow paces in patients with voluntary motor function. Assisted sling walking or underwater treadmill hydrotherapy is used to unload weight while allowing ambulation. 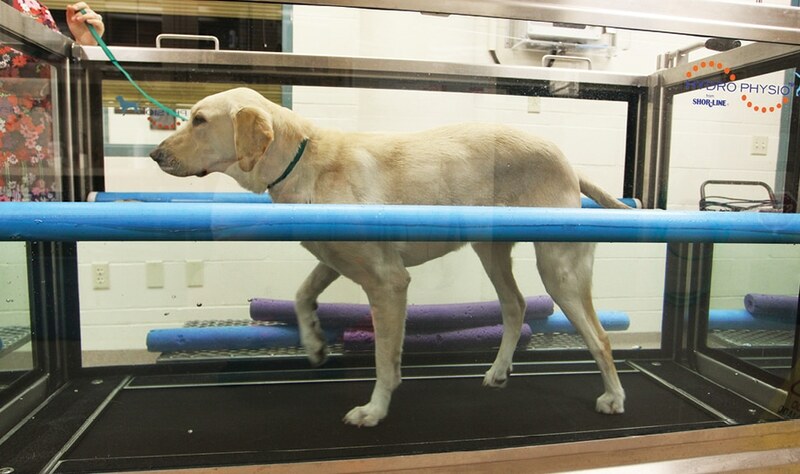 An underwater treadmill can facilitate active movements while supporting the dog’s body weight through buoyancy (FIGURE 8). For example, a dog bears 91% of its body weight with the water at the level of the hock. Increasing the water level to the height of the stifle decreases weight bearing to 85%, while adjusting the water to the level of the hip decreases it to 38%. Furthermore, the resistance of the water helps to improve or build muscle strength. Water is much more resistant than air, making water exercise a better strengthening exercise than land walks. Hydrostatic pressure of the water has been shown to reduce edema and swelling, which may be of benefit in nonambulatory patients. Walking or swimming in water also improves general circulation. The water should be kept warm to provide the beneficial effects of heat to body tissues. Heat increases the elasticity and blood flow of tissue and also helps to relax the patient. FIGURE 10. Neuromuscular electrical stimulation. 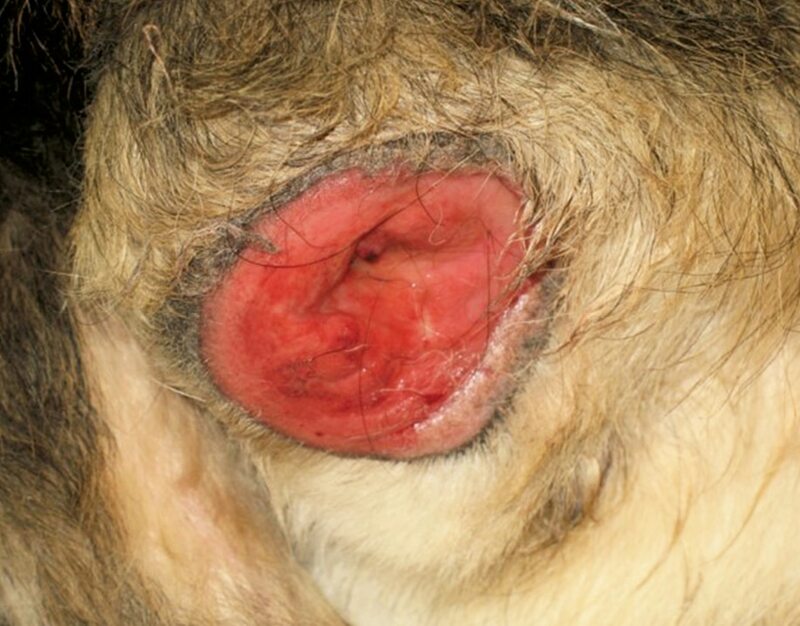 IVDH is one of the most common diseases causing paresis in dogs. It may result in a variety of clinical signs, ranging from spinal hyperesthesia to paraplegia. Many dogs recover if given the proper treatment and nursing care. The skilled veterinary technician is an essential part of the veterinary team and may possess the nursing skills needed to get these patients back on their feet again. Lorenz MD, Coates JR, Kent M. Handbook of Veterinary Neurology. 5th ed. Philadelphia: Elsevier Saunders; 2011. Platt SR, Olby NJ. BSAVA Manual of Canine and Feline Neurology. 3rd ed. Gloucester, UK: British Small Animal Veterinary Association; 2004. Dewey CW, da Costa RC. Practical Guide to Canine and Feline Neurology. 3rd ed. Oxford: Wiley Blackwell; 2016. Olby N, Halling KB, Glick TR. Rehabilitation for the neurologic patient. Vet Clin North Am Small Anim Pract 2005;35(6):1389-1409. Millis DL, Levine D, Taylor RA. 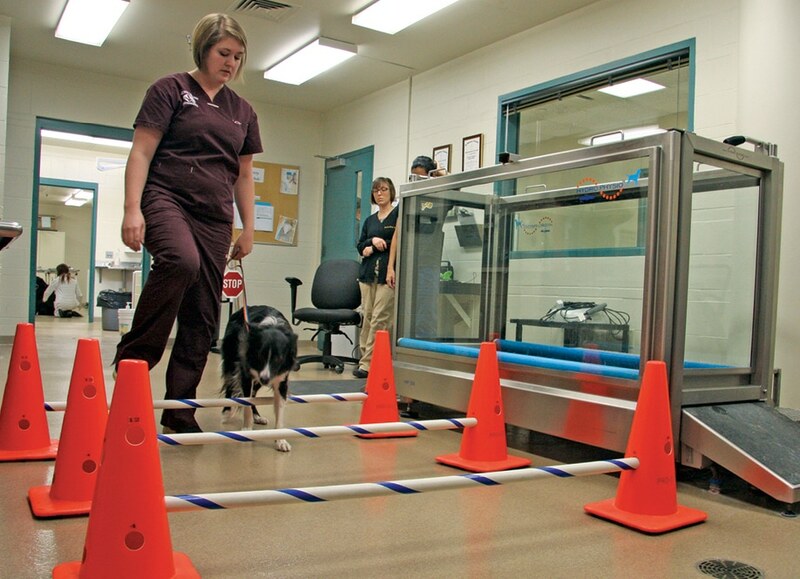 Canine Rehabilitation and Physical Therapy. Philadelphia: Saunders; 2004. The article you have read has been submitted for RACE approval for 1 hour of continuing education credit and will be opened for enrollment when approval has been received. To receive credit, take the approved test online at VetMedTeam.com. A $5 fee applies. Questions and answers may differ from those below. Tests are valid for 2 years from the date of approval. 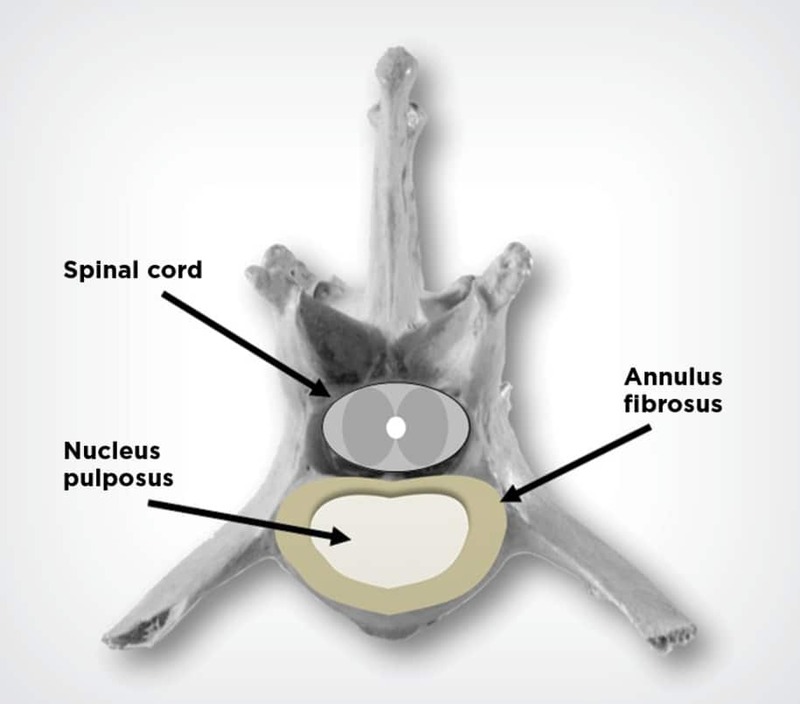 This type of intervertebral disc degeneration results in a protrusion of the annulus fibrosus into the vertebral canal. Which of the following would be an indication for conservative management of Hansen type I IVDH? The recommended time frame of cage confinement with conservative management of intervertebral disc herniation is ________ weeks. What is the most important aspect of conservative therapy for Hansen type I IVDH? Hansen type II IVDH is most common in which of the following dog breeds? Hansen type I IVDH is most common in which of the following dog breeds? Which of the following is the gold standard imaging modality to diagnosis IVDH? Which surgical procedure is known for improving retrieval of the herniated disc in thoracolumbar IVDH with minimal spinal cord manipulation? 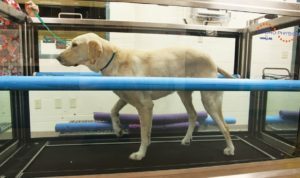 During underwater treadmill therapy a dog bears _______________ of its body weight with the water level at the greater trochanter. _______________ is liquefaction of the spinal cord parenchyma. It is a concern for dogs with absent deep pain perception. What Does a Rise in Antimicrobial Resistance Mean?